Should fright us from the shore." 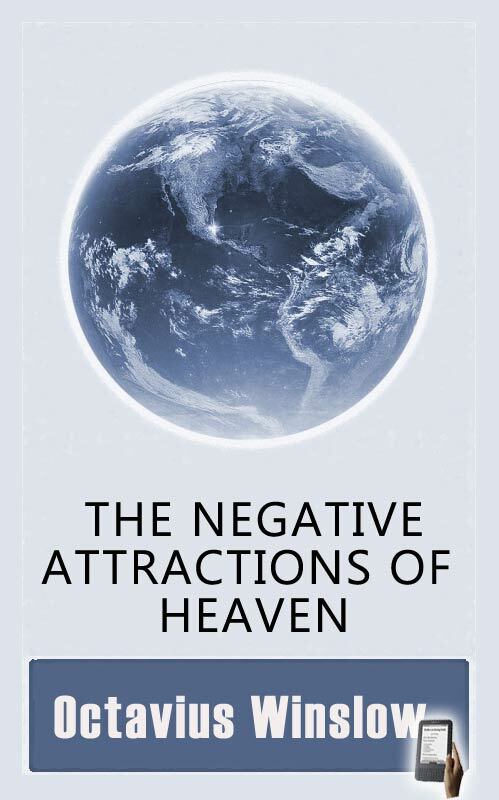 The revealed descriptions of HEAVEN are, for the most part, of an obscure and 'negative' character. The negative style of delineation was probably adopted by the Holy Spirit as more fitted to convey to our minds intelligent and vivid ideas than those positive modes of existence of which the future blessedness of the saints really consists. Who can fail to recognize in this arrangement of the picture the hand of a Divine Artist? Throwing in the background of the canvas some of the darker shadows of the present life, the great and attractive objects of the future are thus made to stand out in more distinct form and in richer glow. By portraying to us what Heaven is NOT, we form a more correct and bright conception of what Heaven really is. By a similar stroke of artistic skill--reversing the picture of our Lord's life of humiliation--we get a more true and realizing idea of His great glory and happiness in Heaven. To be told that He no more sorrows, nor weeps--is no more reviled and persecuted--no more hungers and thirsts--suffers and dies no more--unfolds to us more impressively the great and inconceivable blessedness into which He has entered! What a contrast to the life of lowliness and poverty, scorn and neglect, grief and woe, suffering and death, to which He subjected Himself all for the great love He bore us on earth! What Divine glory now crowns His head! What perfect joy fills His soul! What pure worship robes Him with its incense! What sublime songs of adoration roll in circling waves around His throne! "'Tis past; the dark and dreary night! Of sadness on Your brow. Your heart shall break no more." The design of this little work is to serve a twofold, soul-animating, purpose--as a STAFF, aiding faith's ascent of the glorious height of Pisgah; and then, from its summit--as a TELESCOPE, bringing nearer to its sanctifying and comforting view those sublime beauties and winning attractions of the "land which is very far off," and which, in our present imperfect state, are best understood and felt in their shadowy and negative forms. "Now we see through a glass darkly, but then face to face; now we know in part, then shall we know even as also we are known." Oh, sweet thought! soon we shall spring from the Pisgah of earth to the Mount Zion of Heaven, exchanging the dim glass of faith for the full, resplendent and eternal vision of its glory!--above, and eclipsing all--the beatific vision of "THE KING IN HIS BEAUTY." The battle fought--the victory won!"